Improve your duplex scanning for Venous Reflux or Venous Insufficiency with the Rapid Cuff Inflation System. Get reproducible results and catch the reflux missed when using either Valsalva or hand augmentation. 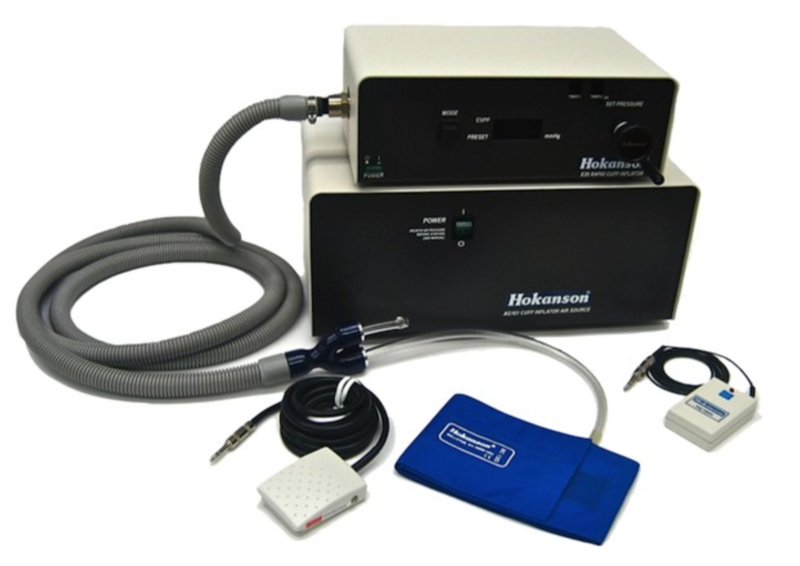 The Hokanson E20 eliminates squatting to squeeze the patient’s leg, compressing all of the soft tissue, holding it for precisely the correct amount of time and rapidly releasing the pressure while you scan the leg for venous reflux. There is no need for a second person to do the compression, reducing the expense of performing this test. The E20 inflates any cuff in 0.3 sec, holds the pressure indefinitely or for whatever time your protocol needs and then instantaneously deflates the cuff. It works every time no matter the size of the cuff or limb. Simply dial in the pressure needed and push the button for inflation and then push the button to deflate. Large digital readout display for cuff pressure from 0 to 300 mmHg. AG101 - source of clean compressed air. Capacity to inflate large contoured thigh cuff every 12 seconds indefinitely. 3 Second timer for automated functionality. Foot Switch that enables hands free user control. Full array of vascular cuffs.